The emu is without a doubt one of the most famous and beloved animals in Australia. Let us take the example of Odo, an emu who lives in an Australian family. Odo is now an adult emu. It is quite a strange bird: it is the second tallest bird on earth (after the ostrich). It is roughly 190cm tall, it weighs about 50kg and can run up to 50km/h. Its feathers are brown on the body and grey on the neck. When it was still a baby emu, Odo was only 12cm tall and weighed 5kg. In six month’s time it has reached its adult size and can now make big leaps: one meter when walking and up to almost three meters when running. Odo cannot fly but it uses its wings while running: they help to keep its balance. It can also swim if needed. 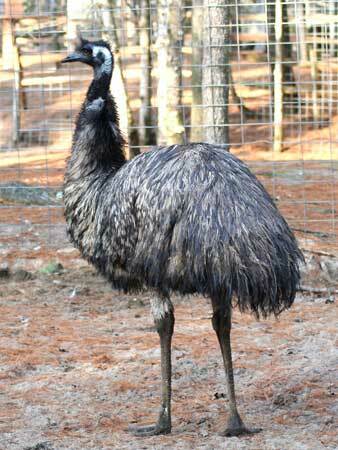 Wild emus are found in forests and savannah woodland; it is less common to find them in populated and arid areas. They also have a seasonal pattern, spending the summer in the north of Australia and the winter in the south. They eat insects and crops that are available as well as stones to assist their digestion (in captivity they also eat shards of glass, marbles, car keys, jewellery, etc.). They do not drink on a daily basis, but when they do drink, it is a lot. Their feet have three toes with claws as sharp as knives, which is useful to kick dingoes (one of their predators). 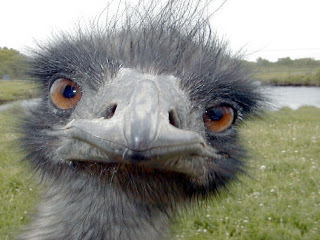 However, when emus are attacked by eagles or hawks, the only way to save their life is to run and swerve or to hide. In the wild, emus live between 10 and 20 years but in captivity they usually live longer. Let us now look at the economic value of the emus. Already hundreds of years ago, Aborigines and early European settlers saw in them a source of profit. They killed these big birds to eat their meat and used the rest of the carcasses for other purposes. The fat was turned into oil to polish the Aborigines’ weapons and the bones were used to make knives. Nowadays, a commercial industry has developed round the bird and does not limit itself to Australia. Indeed, industrial emu farming also takes place in North America, Peru and China, to name but the most productive countries. Emus are not only farmed and killed for their meat: other parts of their body are also in demand. Their eggs are mainly used in cooking, loved for their size (corresponding to ten chicken eggs) and mild taste. Each emu can yield up to six litres of oil, which is then used in cosmetics and pharmaceuticals. Finally, their leather is appreciated and is used to make accessories such as boots and handbags. Apart from playing an important role in the economy, the emu is also an integral part of the Australian culture. According to a creation myth of the Aboriginals, the sun is in fact an emu’s egg thrown into the sky. The bird’s presence on coins, stamps and the Coat of Arms ̶ next to the red kangaroo ̶ further testifies to its importance as national symbol. The name alone (‘emu’) is wide-spread in Australia, being the name of a beer, a scientific journal and up to six hundred places (mountains, lakes, towns, etc.) across the country. I love the Emu image on the blog & would like to use it as the cover image on my book about Australia called "The Blizzard of Oz". I intend to publish the book on the Authonomy website so it will be freely available to all. I will, of course, credit you with the image. Can I use your image please? HI Guys, I hope you can help me. I came across your video of Odo swimming and I would like to speak to you about it as I am doing some research on swimming emus.